ContentPush is the PUP that uses misleading techniques to prevent removal. Use Reimage to locate malicious components and get rid of them faster than with uninstall instructions. A full system scan blocks virus reappearance and prevents traffic to malicious domains. How did this piece of spyware land on my computer system? How to remove Content Push news from Chrome and other browsers? 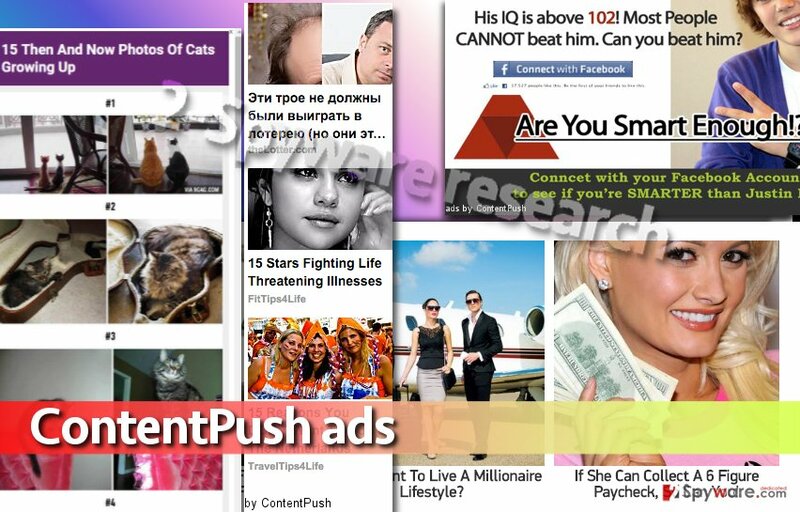 ContentPush virus is a program to avoid if you hate intrusive online advertisements and clickbait titles of vague articles. It appears that this application has been developed with intention to generate online revenue, so once installed, it prepares to deliver loads of ads from various third-party companies. Considering that the activity of this program is highly annoying and hardly useful, spyware researchers have added it to “potentially unwanted programs” (PUP) category and also to adware subcategory. Keeping such program on the system is not a good idea, and there are two ways to uninstall it – manual and automatic. If you want to remove ContentPush automatically, simply install Reimage or a different anti-spyware software and let it clean the system for you. Another option that you have is to delete this ad-supported program manually. Do not worry if you have never tried to do that before – our team has prepared a very easy and detailed ContentPush removal guide, which you will find right under this article. ContentPush ads can appear in various forms. Making a virtual layer, these annoying ads block content of websites that you will try to explore, and that is for sure an unpleasant experience. Trying to close these ads one by one is simply a meaningless activity because this adware never stops pushing promotional content until it gets eliminated from the computer system. Some of these ads can appear entirely safe to click on, but please resist the urge to do so! Advertisements generated by adware programs are supposed to look attractive because the program generates them based on information collected by tracking cookies, which it inserts into victim’s web browsers. Although these cookies cannot track personally identifiable information, they can collect data such as victim’s IP address, browsing and search history, referral data, date/time stamp and so on. Therefore, the adware becomes able of providing advertisements based on user’s browsing habits. We want to notify you and tell you that not all adware programs are trustworthy and some of them might try to use catchy-looking advertisements as bait to convince the user to click on them just to get the opportunity to redirect him/her to affiliate website, which might be filled with hazardous links or downloadables. To put it simply, this ad-supported program increases the risk of visiting insecure websites while giving almost nothing in return. Therefore, we do not believe that such program should be kept on the computer system. There are many PUPs that hijack computer systems the same way that the described adware does (examples include Content Push Client 2 virus, Offers4U and so on). ContentPush hijack occurs when the user downloads a program from the Internet (a free one) and installs it carelessly or in a rush. The problem is that free programs are known to be perfect spyware distributors. If you looked at Custom or Advanced settings more frequently, you would notice that these installation settings reveal various shady-looking components, such as new search engines, browser toolbars, never-heard-of applications and similar pieces of software. Do you need them on your computer? We do not think so, especially because these programs typically are made to present third-party advertisements. Naturally, you need to refuse to install such programs, but make sure you do not choose Default or Standard settings for the installation because these options will widely open the entry to your computer system for all bundled programs. Instead, select Custom or Advanced, and remove ticks next to agreements to install suggested additions. You do not have to wander through your computer system blindly, trying to find files that belong to ContentPush virus. Simply read the information provided in ContentPush removal tutorial, which is presented below. We have prepared it with extra care and hopefully you will enjoy it. If you have any questions about the removal process or the adware, please do not hesitate and send them to us – our team is ready to answer all of them. As always, we present the second uninstall option – if you want, you can remove ContentPush News ads automatically by using spyware/malware removal program. Open Control Panel and find Add/Remove Programs section. Here, sort the list of recently installed programs by data and try to detect suspicious programs that appeared on the list around the same time when ContentPush ads started showing up. Here, look for ContentPush or any other recently installed suspicious programs. Wait until you see Applications folder and look for ContentPush or any other suspicious programs on it. Now right click on every of such entries and select Move to Trash. When in the new window, check Delete personal settings and select Reset again to complete ContentPush removal. Once these steps are finished, ContentPush should be removed from your Microsoft Edge browser. Delete shady browser extensions such as ContentPush from Firefox add-ons panel. Do not forget to refresh Firefox afterward! Here, select ContentPush and other questionable plugins. Click Remove to delete these entries. Now you will see Reset Firefox to its default state message with Reset Firefox button. Click this button for several times and complete ContentPush removal. Remove extensions that you didn’t agree to install. Look for ContentPush -news extension and other similarly named ones and delete them. Here, select ContentPush and other malicious plugins and select trash icon to delete these entries. Click Reset to confirm this action and complete ContentPush removal. Here, select Extensions and look for ContentPush or other suspicious entries. Click on the Uninstall button to get rid each of them. Now you will see a detailed dialog window filled with reset options. All of those options are usually checked, but you can specify which of them you want to reset. Click the Reset button to complete ContentPush removal process. ^ Bryan Gardiner. You’ll Be Outraged at How Easy It Was to Get You to Click on This Headline. WIRED. In-depth coverage of current and future trends in technology. ^ What is spyware?. Palo Alto Networks. Technical Documentation. ^ Ugnius Kiguolis. Anti-spyware. NoVirus. A site that provides comprehensive information about various computer infections. ^ What is PII?. Sophos. Protecting personally identifiable information: What data is at risk and what you can do about it. ^ Bradley Mitchell. What is an IP Address?. Lifewire. Tech Untangled. This entry was posted on 2017-01-10 at 07:11 and is filed under Adware, Viruses. You can quickly scan the QR code with your mobile device and have ContentPush ads manual removal instructions right in your pocket. 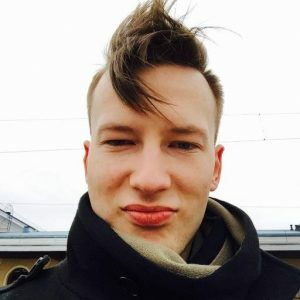 How did you remove ContentPush ads?